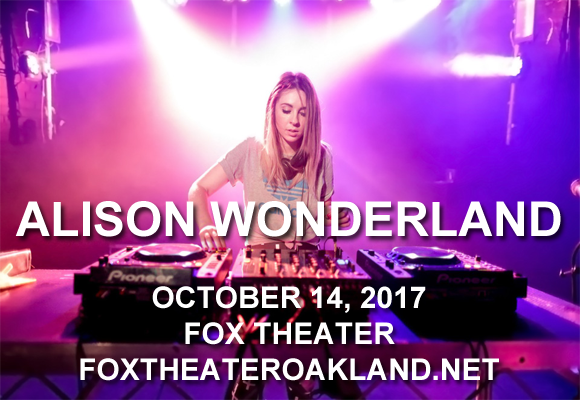 Acclaimed Aussie DJ/producer Alison Wonderland comes to Fox Theater Oakland on Saturday 14th October 2017 on a month-long trek, named the F**k Me Up on a Spiritual Level (FMUOASL) Tour! Sydney-based DJ and producer Alison Wonderland initially trained as a cellist, but signed to EMI Australia in 2013 as an EDM act. Her debut EP Calm Down was released in 2014 and peaked at 38 on the ARIA chart, preceding singles "I Want U" and "Cold", but it was her 2015 single "U Don't Know," featuring Wayne Coyne from the Flaming Lips, that sparked international interest in her music. Wonderland was nominated for two ARIA awards in 2015, Best Dance Release (for the single "Run") and Best Video (for "U Don't Know" featuring Wayne Coyne).